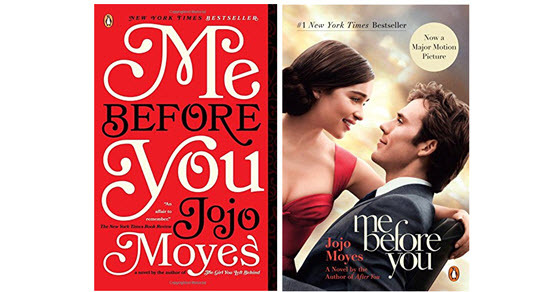 It's Time to Read "Me Before You"
I just finished reading “After You” last night and realized that many of you still haven’t read “Me Before You” by Jojo Moyes. The story revolves around the main characters of Louisa and Will. Louisa has been hired to take care of Will after an accident. As with any good love story, they come from completely different worlds. But don’t confuse it with a light, fluffy summer read; it’s also thought-provoking. The book has 4.5 stars on Amazon with almost 10,000 reviews. And it’s a great deal at only $10 for the paperback and $12 for the Kindle version. If you are one of the people who haven’t read it yet, here’s why you need to. First, everyone is talking about it and you don’t want anyone to spoil the ending for you. You’ll be kicking yourself (and the person who spoiled it) if you don’t just take the time and read it soon. It’s a fairly quick read compared to other books your friends might be recommending (*cough* Outlander *cough*). Second, the movie is coming out in a couple of months (June 3, 2106). If you are one of those people who wants to read a book before seeing the movie, now is the time! The movie will be getting a lot of attention as it stars Emilia Clarke and Sam Claflin. Here’s a preview of the movie but don’t watch if you don’t want to have anything about the book spoiled at all before you start reading it. If you have already read the book, the trailer is a must-watch. Third, as I mentioned before, the sequel, “After You” came out last year and is on a lot of people’s reading lists. You can’t read the sequel until you have read the book itself! Below is an Amazon preview of the book you can start reading to see what you think. The preview is definitely long enough to really get into the book and decide whether it is something you would like to read. You’ll probably want to download the Kindle version immediately to keep reading! Have you read “Me Before You”? Would you recommend it to others? Will you be seeing the movie?